I wrote that post approximately one week ago; since then, I have continued to tinker with my campaign, and I also added a new campaign (for a different program). Both campaigns have had some interesting results (but more on that later!). Today’s post will discuss some of the things I did to address the issues listed above. As this is my first campaign on Facebook, I should not be construed as an expert in this subject matter; I am just sharing my experience as a beginner in Facebook advertising services. Again, comments and suggestions from more seasoned users are most welcome. Where are these clicks coming from? Much to my frustration, I still have yet to figure out if Facebook shows you where the clicks are coming from. Thankfully, I had a plan: I added a bit.ly link to my ad. Bit.ly not only shortens long URLs, but the service also provides some tracking information, including geographical information about where the users are located (see the example in the following screenshot). Bit.ly can show you the geographic distribution of clicks–so you can see the regions where people took an interest in your ad. Users who simply clicked the “Like” button on the ad, allowing them to like our Facebook page, but not to view the content that I wanted them to see. Since the bit.ly fix could not give me a full picture of who interacted with our ad, I still came away feeling somewhat disappointed. It would definitely be ideal if I could see that information within the Facebook interface. I can’t help but wonder if this service is actually included somewhere in the ad interface; am I simply missing it? This was one of the most frustrating issues that I came across over the past three weeks that I have been advertising on Facebook: some ads have plenty of impressions while others do not. In addition, it is also possible to have an ad produce many impressions over a day or two, but then stop (or drastically reduce) its impressions on subsequent days. 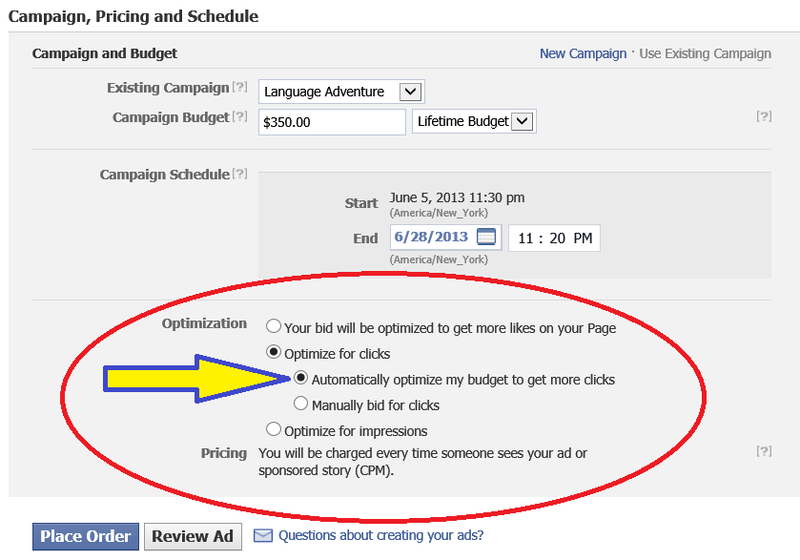 I selected the option to let Facebook automatically adjust my cost-per-click. Under the manually bid for clicks system, several ads had nearly no impressions, and no clicks at all. With the automatically optimized budget system, I had only one ad that had zero clicks. Granted, this is not comparing apples to apples, as they are different programs marketed to different people in different countries; however, the fact that I had fewer ads with zero clicks or impressions seemed promising. I plan to explore this option more in the future. What were the users clicking on? The “Like” button to like our page. Certainly, there are some positives there–any click is an interaction and demonstrates an interest in our page. Interestingly enough, the additional traffic forced a few unexpected changes upon us. For example, our followers (i.e., number of people who “like” our page) jumped from approximately 1,600 to over 2,200 in the past 3 weeks since I began the campaigns. This huge increase in traffic changed the nature of our Facebook page. We typically used the page to reach out to a smaller community of our current and former students, including announcements about courses, deadlines, etc. Now, I find myself posting more marketing-related messages and images on it, catering to potential students, as well as to current students and alumni. I have also begun posting alumni success stories as a way to motivate our current student population. That being said, I think I finally figured out why there is such a difference in the links that have been clicked on in these ads. 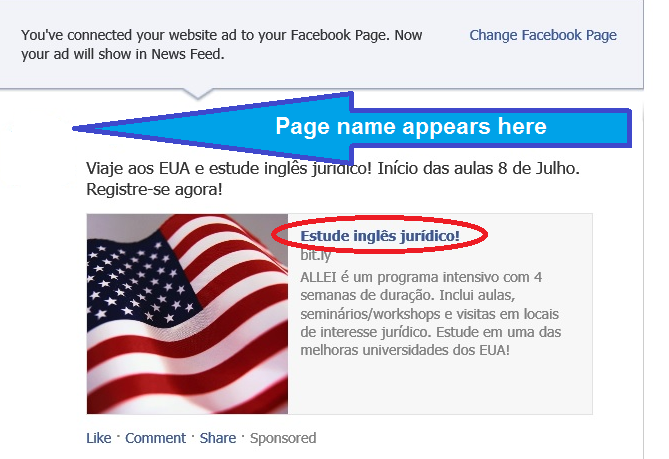 When the Facebook ads are created, they are posted in two formats: a small ad that appears in the right column, and a larger ad that appears in the users’ news feed. A sample of the News Feed ad vs. the Right-Column ad. On the right column ad, the title is clickable and goes directly to our target website. The most visible text on the link goes to the target web page for the program we are trying to sell. There is also a “like” button that is normally underneath the image, as well, allowing the user to follow the page right away. The news feed ad, on the other hand, has several clickable areas. The most obvious text is the name of the organization’s Facebook page; after clicking on it, the user views the page. By contrast, the text that links to the actual target web page is less obvious (see the red circle in the screen shot below). The most visible text in the News Feed ad is the page name. When clicked, it takes the user directly to the Facebook page. The right-column ad, which is more optimized to lead to my target web page, does not appear on mobile phones; this means that a huge proportion of Facebook users in my target market do not actually see it. This is actually the purpose of the news feed ad–it shows up on the interface of all Facebook users, regardless of the device. 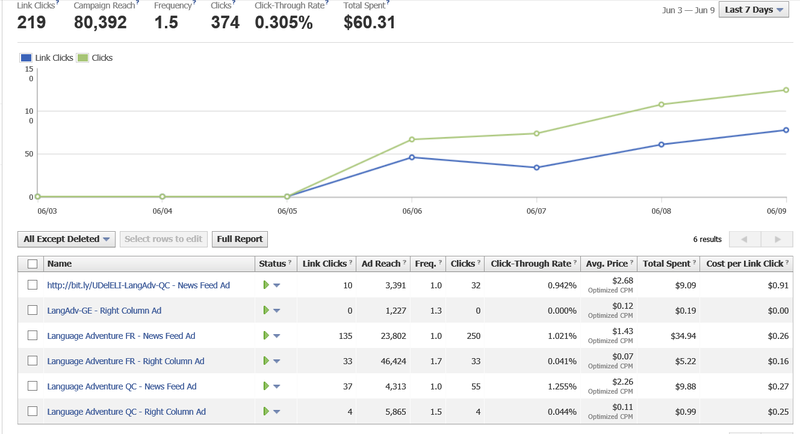 As a result, there is a very big difference in the number of clicks on right-column ads and news feed ads. This means that most users are seeing the ad format that is not optimized to take them to my target website. Before wrapping up this post, I will say that this has been an interesting experience so far. Facebook makes it easy to post ads within a small budget, and to experiment with those ads to find a combination that will work. I don’t think I have found a truly winning combination until now, but I am certainly willing to keep trying! My next post, “My First Facebook Ad – Part 3: Sponsored Stories” will discuss what happened when I added “sponsored stories” into the mix.